Solomon, of course, is best known as the indefatigable writer of serial nonsense in the set of columns known as the Deniers, each one profiling a researcher who supposedly had inconvenient facts to present for the IPCC. The profiles were pretentiously labeled with roman numerals; I think he got up to around Part XXVIII, before moving on to other science-mangling pursuits. Problem was, some of the genuine scientists Solomon misrepresented took umbrage, and one, astrophysicist Nigel Weiss, had to wait months for the Post to retract what he considered a “slanderous fabrication”. In his recent Full Comment post, Solomon piled one whopper on top of another in an effort to paint Google as an environmentally correct gatekeeper of information, and suggested readers in search of the truth would be much better off with Microsoft’s benighted new search engine Bing. His first example concerned an unexplained scandal of apparently epic proportions. Search for “Googlegate” on Google and you’ll get a paltry result (my result yesterday was 29,300). Search for “Googlegate” on Bing, Microsoft’s search engine competitor, and the result numbers an eye-popping 72.4 million. If you’re a regular Google user, as opposed to a Bing user, you might not even know that “Googlegate” has been a hot topic for years in the blogosphere — that’s the power that comes of being able to control information. Riveting stuff, I’m sure you’ll agree. Anyway, for some reason, Bing’s estimate is waaaay off, but you can only figure that out by going to the end of the results (editing the start parameter in the URL, naturally). That’s not a promising start, but Solomon is quickly on to the main event – a rigorous comparative study of the two search engines’ treatment of the term “climategate”. According to Solomon, Google has steadily whittled away at the number of pages it returns, while Bing lets the light of truth shine – all 50 million pages of it. 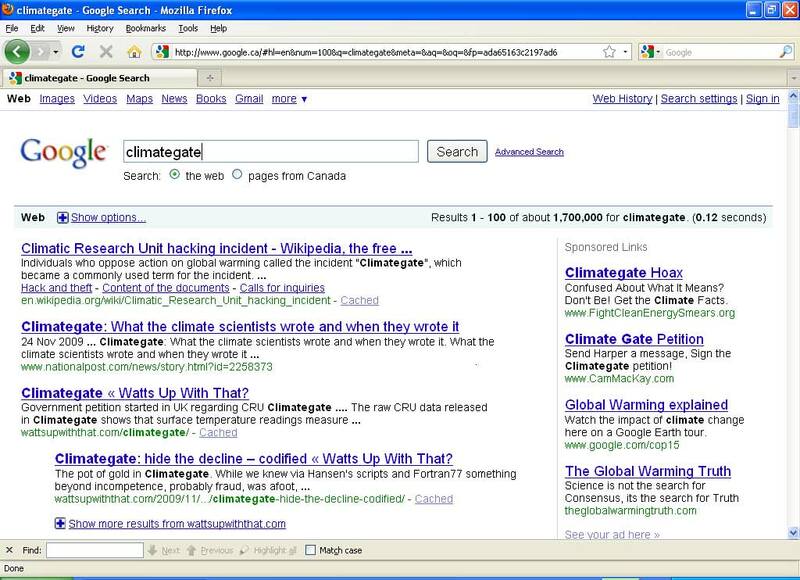 And yesterday, when I checked, Google reported a mere 1.8 million climategate pages. Bing, in contrast, didn’t make climategate pages disappear. As you’d expect from a search engine that wasn’t manipulating data, search results on Bing climbed steadily until they peaked at around 51 million, where they have remained since. When I checked I saw 18 million hits, not 1.8 million. But, hey, what does an order of magnitude matter? More to the point, Solomon seems blissfully unaware that both search engines return a maximum of 1000 hits, not that he or anyone else is ever going to go past the second page of results. And we’ve already seen Bing’s rigorous hit estimation algorithm in action. Another of Solomon’s canards involves Google’s query suggestion feature. But suddenly in late November, for reasons known only to Google, Google often would not suggest “climategate” to those who keyed in c-l-i. Even c-l-i-m-a or c-l-i-m-a-t-e-g-a-t weren’t enough to solicit a suggestion. Bing, in contrast, did not and does not steer users away from climategate — it has consistently suggested “climategate” to those who keyed in c-l-i or even c-l.
Yep, there’s “climategate” – all 18 million hits worth. And Bing? Not so much. And maybe, just maybe, the users who reported a lack of query suggestions in Google had the feature turned off. It is a user option, after all. The tiny blue blip at the end of 2009 is “climategate” (blue). 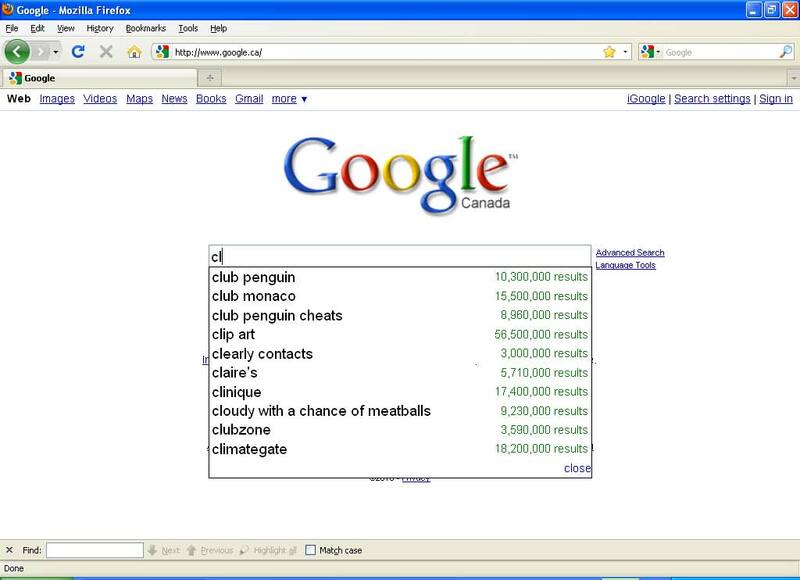 No wonder “club penguin” is at the top of the suggestion list and “climategate” at the bottom (and gone from Bing). In fact, climategate might well not have made the list at all were it not for strong news coverage. Of course, it makes eminent sense that auto-completion would be based on actual search behaviour and interest, rather than sheer number of web pages. And here is the chart for the last 30 days (again updated dynamically), which clearly shows just how low climategate search volume is, even at a time of maximum coverage from the right-wing press. Are we done? Not quite. Solomon has complaints about the pages returned. The first hit returned by Google is – the horror of it – the Wikipedia page on the “Climatic Research Unit hacking incident”, which Wikipedia refuses to call by its true and proper name, as determined by a consensus of objective bloggers and right-wing columnists. For those whom Google can’t steer away from “climategate,” and who key in all 11 letters to learn about the eye-opening emails, Google goes the extra yard in keeping people in the dark — it dishes up a page that trivializes the scientific significance of climategate. Well, sure, after all that compelling analysis, how can we not accept Solomon’s persuasive case for the “scientific significance of climategate” and the Google/Wikipedia conspiracy to “trivilaize” it. On the other hand, there are other equally plausible explanations. For example, perhaps William Connolley (aka Stoat) has been enlisted in a socialist plot to drive Lawrence Solomon mad. If so, it looks like it’s working. But surely at least some people will avoid Google’s snares, and go to the second or even the third link. So let’s see what they’ll find. Number two is none other than … the National Post! And that’s followed by two hits from WUWT. The truth is out there, and even Google can’t stop it. There’s no trace of the Post at Bing. But I did find the highly informative Climategate.com, which recently featured as its lead post a glorified ad for the new Steven Mosher/Tom Fuller quickie book on Climategate. Surely, then, Post editors will agree with the sentiments of this set of search links. Solomon also has a ready answer as to Google’s motivation for “manipulating” search results. Money and power could have something to do with it. Search for Google and its founders and you’ll see that they have made big financial bets on global warming through investments in renewable and other green technologies; that they have a close relationship with Al Gore, that Google CEO Eric Schmidt is close to Barack Obama. My, the Post must have good lawyers indeed. Alas, a full discussion of the scientific wisdom of Solomon, as well as his mysterious Energy Probe “environmental” organization, must await another post. This entry was posted in Climate science disinformation and tagged Bing, Climategate, Financial Post, Google, Lawrence Solomon, National Post. Bookmark the permalink. Now I can go to sleep with a smile on my face. Thanks! It’s a crazy world – well, a world full of crazies anyway!He’s not expecting much of his readership, is he! Who taught him math? Steve McIntyre? Google suggestions are personalized. I have fallen in this trap myself. You can change this in user preferences or delete your google.com cookies to see what other people are getting. On the other hand, the idea that “climategate” should be a top 10 search starting with “cli”; that such a result shows superiority of the search tool that provides it rather than vulnerability to search engine optimization tricks; reveals a worldview that requires clinical attention. [DC: I’ve also tried searching on other computers. When searching at the Google main page (which actually defaults to Google.ca for Canadian users like Solomon and myself), I have always gotten the list of options shown above for “cl”. For other Google searches, such as a toolbar or Firefox home, the suggestion completions are quite variable. Certainly, though, the use of suggestions is a user preference that can be turned on or off as I noted above. Wow, Solomon needs a serious reality check. Could have gotten it more wrong had he tried? I just love how he repeatedly uses misinformation and distortion to try and refute alleged ill doings of his enemies, and it seems that he perceives many of them out there. Anyhow, history is not going to paint a pretty picture of the shenanigans of Solomon. Johnmac “He’s not expecting much of his readership”, well it is the NP after all…..
Unsurprisingly, Solomon’s latest conspiracy rant made it into the print version – Saturday the 16th. .. and some varying point of views expressed. Do the folks over at Google know of Mr. Solomon’s bunk allegations? I do not think that they would take too kindly to someone making such fallacious and ludicrous allegations about them in a national paper. Personally, I think Google should give greater weight to authoritative sources. At least, those are the search results that I’d prefer to see. I think they should put a “customize my search” checkbox directly on the Search form (since 90+% of users are probably not aware of it), and in configuring your custom search preferences, you could choose “search by popularity” vs. “search by authority”. and, IMO, the latter should be the default setting. hey! Lay off Lawrence! He’s 168 and his only problem with IT is that he’s stupid. 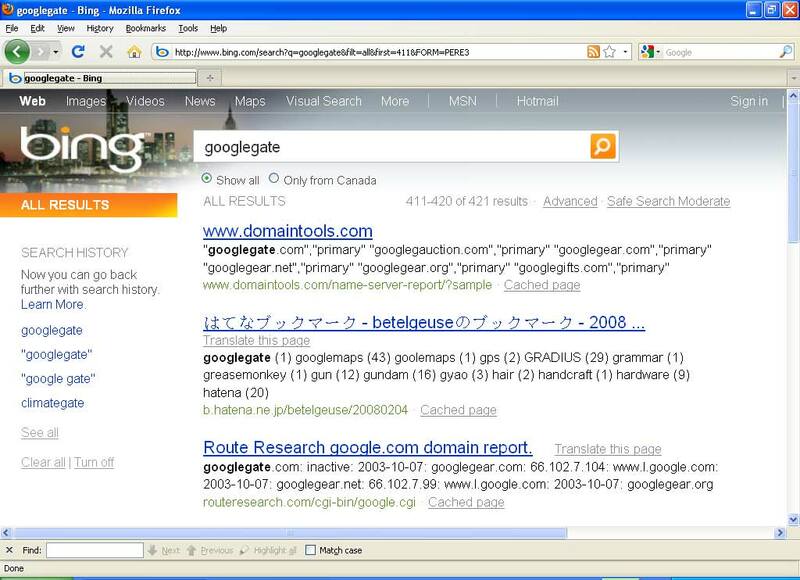 Although I think Solomon is looney, I tried typing ‘googlegate’ into bing and I did get 73.5 million results. Advanced ‘exact phrase’ search yielded 8600. Just how did you get 421? Ah yes, from the same publication that published a story claiming the Iranian gov’t was about to pass a bill forcing all Jews to wear Stars of David . . .
interesting: i ran into just this topic completely by accident yesterday, on the XKCD forums (first time i’ve been there, i swear!). so it’s not a new meme (the post dates from last December). though it would be naive to expect such concentrated levels of stupidity to have a short half-life. Yes, that meme has been around long enough to generate its own Google suggestions. Try entering “climategate google” to see those. There is an arcade game in which cute little furry groundhogs pop up from little burrows and the player has a rubber hammer with which he tries to hit the litle hogs and win a prize. This is how the climategate game is now played. DC ( and JR ) are running around the web with their little rubber hammers trying to knock down pesky little deniers who just keep popping up. They are even doing it in the MSM now. You’re going to need bigger hammers soon. Its a good game but who is going to win the prize? RockyMtn, what was it that you wrote that set him off like this? It would be interesting to know what would justify being rude and hostile on his site. As opposed to being, say, venal and insinuating.